Apparently only 18% of US companies have a formal win loss program. Thus, in most new business situations, sales people don’t have a complete and accurate understanding of why they won or lost sales. If armed with such data, Sales can make behavioral changes to improve close rates by 15%. According to Anova Consulting Group’s research, the sales process is often a top driver of the purchase decision, whether the business is won or lost. Richard believes that sales people should not conduct these win loss interviews since they often take the loss too personally and might try to re-sell the customer on their solution, be aggressive, defensive or dejected, which causes the customer to clam up or just to tell part of the story, the part that doesn’t involve Sales. Prospects can also be uncomfortable talking with the salesperson whose solution they just rejected. **Do not attempt to gather win loss feedback during the same call when you learn the sales outcome. **Schedule a phone call or in-person visit with the decision-maker a couple of weeks after the sales decision. **Take time to prepare the questions you want answered and seek input from your sales organization. **This debrief questionnaire should include questions around the customer’s decision-making criteria; qualitative questions around your firm’s strengths and weaknesses; benchmarking against competitors; and the sales process (more detail to develop a win loss questionnaire). **This preparation will get you grounded, and will help you neutralize your emotions around the win or loss and let you focus on how and what you can learn. **At the end of the win loss interview, ask your customer if you missed anything. In my experience, this is when the floodgates open. **Build rapport. Learn as much about your prospect(s) as you can through the Internet, LinkedIn, Google, Twitter and industry associations. **Don’t just plan your presentation: prepare the initial discussion you will have with each prospect. Ask some open ended questions to engage them. **Develop a second approach to build rapport in case the first approach doesn’t work. **Be consultative: if your product or service is not what the customer is looking for, refer them to someone who can help them. **Remember people want to buy from experts, not salespeople. Research Research Research! Appendix B tells Sales Managers how to implement a win loss program. It is practical and well thought-out. Two factors stand out from my experience with developing win loss programs. 1. Does the program have executive level sponsorship and comprehensive buy-in from critical areas of your company? 2. Will the program be well integrated with existing processes already developed at your company? I have learned the hard way that buy-in is essential at all levels. Some programs never get off the ground due to this lack of communication, sponsorship and integration. My only criticism is Richard’s strong bias towards using a third party to conduct the win loss analysis. I agree a third party brings less bias to this process, and can offer customers anonymity when reporting back to your company. However, I experienced good results conducting win loss analysis for my company prior to consulting. There are some advantages that internal sources have: they know your company’s products and services better than any third party since this is their full time job. Thus they can probe more deeply in these areas than can a consultant. They also know your company’s culture. Sometimes consulting firms recommend change that won’t work with your company’s culture, even though it’s a great idea. I recommend this book for those in marketing and sales who want to implement a win loss program. I particularly recommend this book for salespeople who want to be BETTER. It clearly defines the value proposition for conducting win loss analysis, especially for Sales. Don’t be left out! How many companies say “Our Employees are Our Most Important Asset,” but their actions don’t match these hollow words? This is not the case at Southwest Airlines, where employees are valued in all phases of their relationship with the company’s management from the hiring process; allowing them to do their job and to make decisions that don’t quite follow the “rules,” but are often the right decision for the circumstance; to letting an employee go—tough LUV—who isn’t a match for the company’s culture. 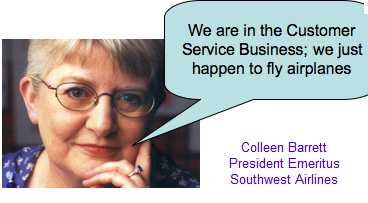 Colleen Barrett, Southwest Airlines President Emeritus, was our keynote speaker at ASP’s (Association of Strategic Planning) annual conference. Her recently published book, Lead with LUV, co-authored with Ken Blanchard details Southwest Airline’s formula for success. “Profit is the applause you get for creating a motivating environment for your people and taking care of your customers.” The airline has been profitable since 1973 two years after it was formed. Hmmmm treating your Employees as Customers works! Southwest Airline’s employees do their best to ensure that Customers have a safe, on-time flight, for a reasonable price, with as little stress as possible, in a caring environment with a little humor to boot. In these tough times, Southwest Airlines does not charge an extra fee for luggage, unlike all its competitors who do. A resulting customer benefit is that the planes are not crammed full of luggage which takes a long time to stuff into compartments. A resulting operational benefit is passengers get on and off the planes faster, so Southwest Airlines can turn them around faster than the competition. 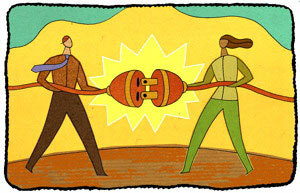 Employees follow servant leadership practices where they serve first and lead second at every level of the company. This promotes the egalitarian attitude that prevails at Southwest Airlines and makes it such a desirable place to work! Servant leadership was inspired by Robert K Greenleaf: A Life of Servant Leadership by James Sipe and Don Frick . In addition to traditional approaches, such as sending out cards on employees’ birthdays or anniversary dates of hire, the company sends notes of sympathy and condolence to employees when their family members are sick or die. As in cooperative intelligence leadership, all levels of management pitch in to get the job done. When the plane lands, everyone rushes to clean it out, including the pilots, as one of Southwest Airline’s competitive advantages is the speed with which that aircraft is back into the air producing revenue. Southwest Airlines has a painstaking hiring process, and they run a lean operation. While many candidates have simlar professional qualifications and experience, it’s the right attitude and behavior that differentiate those who are hired and who stay—which is most employees. What differentiates my experience with Southwest Airlines, is the fun that the employees share with us customers. One of my favorite customer service stories Colleen shared was just after 9 11 when one of the pilots rented a bus to take his stranded, stressed out passengers to the movies. He didn’t have to ask management’s permission, and didn’t tell management what he had done. Management heard from delighted customers. Southwest Airlines has many, many delighted customers. It has grown to be one of the largest US carriers from its humble roots in 1971, where it had to fight hard against the major US airlines to even enter the business. Southwest Airlines is true to its original goal to make air transportation affordable for most people. What’s interesting to me as a competitive intelligence professional is how Southwest Airlines has publicized its competitive advantages for years giving its competitors the opportunity to study, analyze and adapt them to their operation. The one thing that just doesn’t translate is the supportive, egalitarian and fun loving culture that Southwest Airlines has valued right from its inception. I was one of the lucky ASP attendees to win a copy of Colleen’s book which she signed “with LUV”.